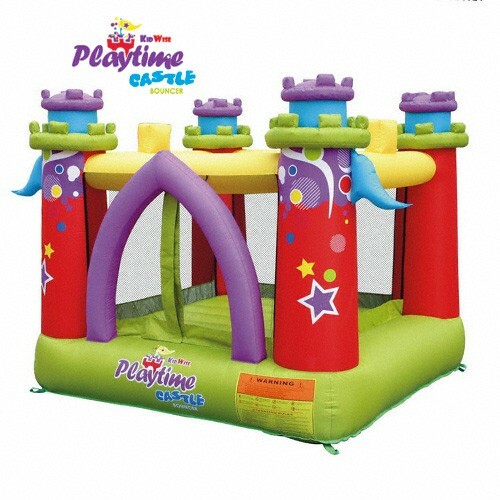 The Playtime Castle Bouncer is a bounce house made for everyone. Bright gender neutral colors make this a fun play environment for both boys and girls. The Playtime Castle bouncer is light weight so it is easy to set up and use. The Bounce house is constructed of durable 420D Oxford nylon fabric, reinforced double stitching and a vinyl backed bounce floor that is made to last. Up to 2 kids can bounce with a 200lb weight limit for use. The Playtime Castle Bouncer is ideal for kids 3-8 years of age. The bounce area of the jumper is approximately 58" x 64" and a 74” overall height. The bouncer comes with everything you need including 110v Blower, Carry Bag, Bouncer, Stakes and Instructions.